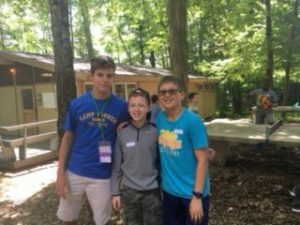 Kfirim Campers Have Arrived at Yavneh! 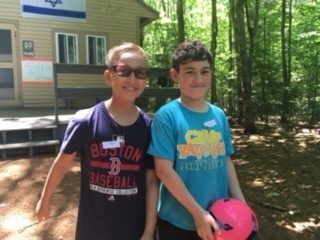 We are so excited that the chanichim (campers) have arrived! We had a really nice time meeting parents and helping the chanichim settle in. We began with a morning full of ice breakers. The chanichim had a great time getting to know their bunkmates and making new friends. The whole camp met at the toren (flag pole) for mifkad (flag raising). From mifkad we went into the chadar ochel (dining hall) for our first meal together. The chanichim were so excited to eat the pizza. After lunch there was an opportunity for some rest followed by the afternoon peulot (periods). The chanichim had their swim test and had a meeting to talk about camp and bunk rules. Younger Kfirim had a tour of camp and older Kfirim played a fun game called “Hula Huts” in which chanichim throw balls and try to knock down a structure made of hula hoops. After shower time and dinner, the chanichim had a beach-themed peulat erev (evening activity). The peulah started with a game called “Finding Nemo” in which one person is tapped as Nemo and the goal is to ask around until Nemo is found. This gave the chanichim an opportunity to learn some names of other chanichim in the aydah. We then had a round robin in which chanichim moved around to different stations playing different ice breaker games that had a beach theme to them. It is so great to have the chanichim here and we know that they are going to love the amazing summer they have ahead! Happy birthday to Lily and Jacob Kress!! !